Oshkosh Defense, LLC, an Oshkosh Corporation (NYSE: OSK) company, announced today that U.S. Army Tank-automotive and Armaments Command (TACOM) Life Cycle Management Command (LCMC) has awarded Oshkosh Defense a firm fixed price requirements contract spanning up to seven ordering years for the Family of Medium Tactical Vehicles (FMTV) A2 variant. The initial estimated contract value is $476 million with no cap on the number of vehicles the Army may purchase. Oshkosh Defense has manufactured and sustained more than 150,000 Tactical Wheeled Vehicles for the U.S. DoD and its allies. 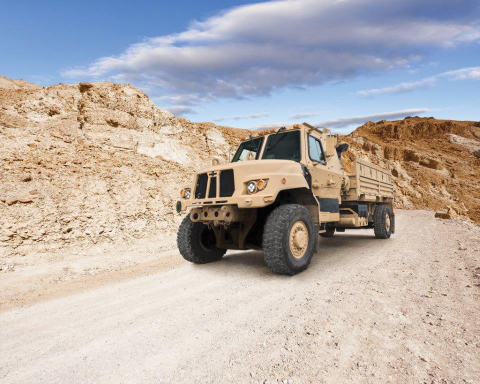 Oshkosh Defense was first awarded the FMTV contract following a competitive evaluation in 2009 and, to date, has delivered more than 36,000 FMTV trucks and trailers. The U.S. Department of Defense recognized Oshkosh Defense with the Value Engineering Achievement Award for improvements that resulted in millions of dollars in cost savings for the U.S. Army, as well as improved performance and reliability. Oshkosh Defense submitted the FMTV A2 proposal in response to the U.S. Army’s competitive RFP that required bidders to validate and produce an upgraded FMTV A2 fleet of vehicles with improved payload, underbody protection, ride quality, mobility, engine power, electronics, diagnostics, and safety enhancements. The future generation FMTV A2 to be provided by Oshkosh will be comprised of 16 models and associated trailers capable of carrying payloads ranging from 3-ton to 10-ton, and performing a wide range of duties from supporting combat missions, to relief efforts, to logistics and supply operations. Oshkosh Defense is a leading provider of tactical wheeled vehicles and life cycle sustainment services. For decades Oshkosh has been mobilizing military and security forces around the globe by offering a full portfolio of heavy, medium, light and highly protected military vehicles to support our customers’ missions. In addition, Oshkosh offers advanced technologies and vehicle components such as TAK-4® independent suspension systems, TerraMax® unmanned ground vehicle solutions, Command Zone™ integrated control and diagnostics system, and ProPulse® diesel electric and on-board vehicle power solutions, to provide our customers with a technical edge as they fulfill their missions. Every Oshkosh vehicle is backed by a team of defense industry experts and complete range of sustainment and training services to optimize fleet readiness and performance. Oshkosh Defense, LLC is an Oshkosh Corporation company [NYSE: OSK]. To learn more about Oshkosh Defense, please visit us at www.oshkoshdefense.com. Founded in 1917, Oshkosh Corporation is more than 100 years strong and continues to make a difference in people’s lives. Oshkosh brings together a unique set of integrated capabilities and diverse end markets that, when combined with the Company’s MOVE strategy and positive long-term outlook, illustrate why Oshkosh is a different integrated global industrial. The Company is a leader in designing, manufacturing and servicing a broad range of access equipment, commercial, fire & emergency, military and specialty vehicles and vehicle bodies under the brands of Oshkosh®, JLG®, Pierce®, McNeilus®, Jerr-Dan®, Frontline™, CON-E-CO®, London® and IMT®. Today, Oshkosh Corporation is a Fortune 500 Company with manufacturing operations on four continents. Its products are recognized around the world for quality, durability and innovation and can be found in more than 150 countries around the globe. As a different integrated global industrial, Oshkosh is committed to making a difference for team members, customers, shareholders, communities and the environment. For more information, please visit www.oshkoshcorporation.com. This press release contains statements that the Company believes to be “forward-looking statements” within the meaning of the Private Securities Litigation Reform Act of 1995. All statements other than statements of historical fact, including, without limitation, statements regarding the Company’s future financial position, business strategy, targets, projected sales, costs, earnings, capital expenditures, debt levels and cash flows, and plans and objectives of management for future operations, are forward-looking statements. When used in this press release, words such as “may,” “will,” “expect,” “intend,” “estimate,” “anticipate,” “believe,” “should,” “project” or “plan” or the negative thereof or variations thereon or similar terminology are generally intended to identify forward-looking statements. These forward-looking statements are not guarantees of future performance and are subject to risks, uncertainties, assumptions and other factors, some of which are beyond the Company’s control, which could cause actual results to differ materially from those expressed or implied by such forward-looking statements.